On April 26 there was a small planting event (about 120 plants ) aimed at improving the ground-layer and shrub-layer surrounding the trees straddling the Valley Track in the Dam and Central Paddocks, north-west of the Dam. This area is currently nearly devoid of any shrubs and ground-layer native species, and the aim is to enhance the bird habitat. See the map above for the location of the planting. The first of Briar Rose Replacement Program plantings was held on Saturday May 10th and planted around 250 shrubs and groundcover plants. These were planted in groups of about 4 plants in strategic locations to provide small bird habitat in and around one of the key gullies, enhancing the existing vegetation and the connection between the Pinnacle Nature Reserve to the neighbouring Kama Nature Reserve to the southwest (see map below). 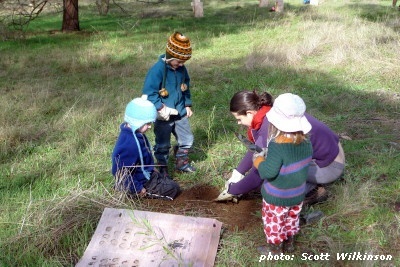 Funded by the ACT Government's Woodland Restoration Project, Greening Australia augered the holes for us and provided the plants. A grant from the Lower Molonglo Catchment Group provided funding for biodegradable shrub guards and stakes. This small planting event only involved around 100 plants in the area just south of the Forest block. Our aim with this planting was to complement the trees that were planted there in the 1990s by adding shrubs and some groundcover plants such as daisies and native grasses. See the map above for the location of the planting. This is the next step in the ACT Government's Woodland Restoration Project in the Belconnen Hills (see below), which is aimed at establishing wildlife corridors around the ACT. This planting is sited to help bridge the gap between the Pinnacle Nature Reserve and the Kama Nature reserve on the other side of William Hovell Drive. It comprises 300 plants. As with our planting in September 2012, Greening Australia pre-dug all the holes and provided the plants, tree guards and the necessary tools. 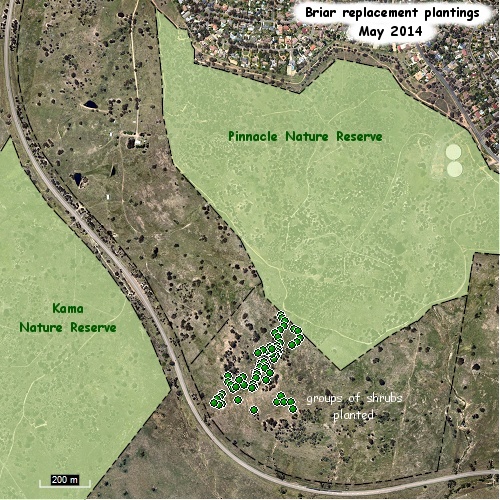 Since planning began for the 2011 planting, we've seen the emergence of the ACT Woodland Restoration Project. This is an ACT Government funded project that will see strategic plantings take place throughout the ACT over the next 3 years. The aim of these plantings is to establish viable wildlife corridors between Canberra's suburban reserves and the surrounding bush. It arose from the ACT Lowland Restoration Strategy (2004) [ 2.7 MB] after a series of community consultations in 2011. 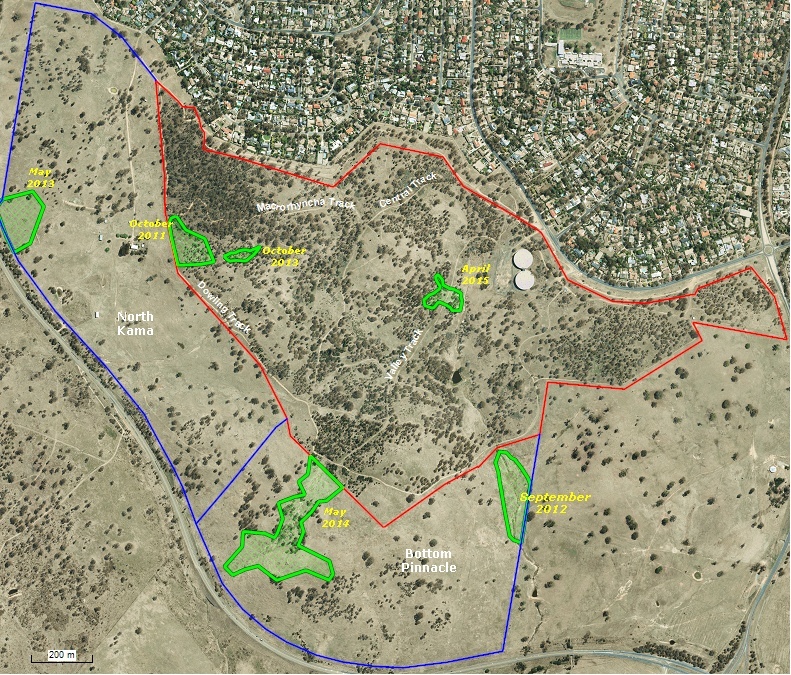 One part of this strategy aims to establish a wildlife corridor between Black Mountain and the Murrumbidgee, encompassing the Belconnen Hills reserves (Aranda Bushland, Mt Painter and the Pinnacle) as well as the Cook horse paddocks, Bottom Pinnacle, North Kama, Kama Nature Reserve and the Woodstock Nature Reserve in the lower Molonglo valley. The extent of this program is described in the Belconnen Hills Woodlands Restoration Workplan [ 6 MB], and work got underway in early 2012. 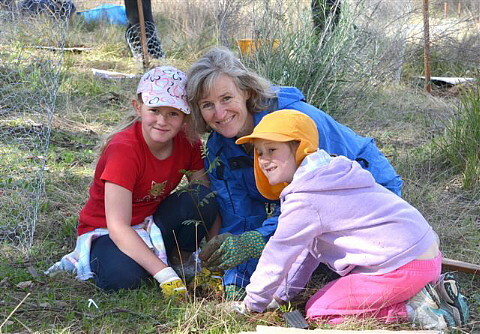 Greening Australia is contracted by the ACT Government under the Plan to undertake a range of restoration activities, including supporting parkcare group planting events. On a lovely first day of Spring, 35 fotpin volunteers gathered for our Family Planting Day that saw the first and largest of the Pinnacle plantings under this scheme. See the map above for the location of the planting. Roughly 450 tubestock, including Yellow Box (E. melliodora), Blakely's Red Gum (E. blakelyii) and Native Blackthorn (Bursaria spinosa), were planted along both sides of Deep Creek in Bottom Pinnacle. The areas planted are clearly visible looking south from the pumphouse, and help form a corridor of vegetation between the Pinnacle Nature Reserve and the Molonglo. We were very fortunate to have the ACT Minister for Environment and Sustainable Development, Simon Corbell MLA, join us and help with the plantings, and share with us his views on The Pinnacle, the Belconnen Hills corridor and the Woodlands Plan. Having completed the planting by lunchtime, everyone tucked into a sausage sandwich or two and left satisfied at a job well done. Fotpin weeders agreed the general area of this planting becomes a new priority for our weed control activities. fotpin is grateful to the Greening Australia team, led by Ian Rayner, for their cooperation and excellent organisation of this event. For images of the day, see the 2012 Family Planting Day Photo Gallery. In March 2011, through our consultations with other Parkcare groups, we became aware of a grant for planting projects being offered by Spicers Paper through Landcare Australia. Initially we were reluctant to apply for the grant, since the time frame was quite short and we did not want to be rushed into making decisions we might regret later. However, eventually we were persuaded that a small-scale pilot project would meet the requirements of the grant and provide us with an opportunity to gain some experience that would feed into larger projects down the track. This led to a community planting day on 9 October 2011. On that day a total of 218 trees, shrubs and groundcover species were planted in the northwest corner of the Kama paddock. See the map above for the location of the planting. Click for a full report on the 2011 planting [ 292 kB], and for a photo story of the planting day.